We know from the current Booster Gold series that Rip Hunter is kind of a jerk. Ordinarily the chip on Rip's shoulder, however, has to do with Booster's hijinks, and the weight of keeping all of the timestream safe. In future-DC Comics Senior VP Bob Wayne and Lewis Shiner's Time Masters miniseries, however, Rip is more than preoccupied -- he's downright obsessive, singularly focused on his nascent time travel research and a history-spanning villain built from the best of conspiracy theories. Wayne and Shiner's miniseries is a dark re-creation of the Rip Hunter and Time Masters characters just after DC's Crisis on Infinite Earths reboot, far removed from the colorful "Booster meets the Teen Titans" adventures we've seen the Rip Hunter character involved in of late. Moreover Time Masters is a send-up of some previously established superhero tropes, in a way that must have seemed vitally important in that early post-Crisis era. With the upcoming DC post-Flashpoint relaunch, I find myself looking a little more closely at how DC and their creators handled the landscape just after their last big reboot. As Geoff Johns points out in his introduction to Time Masters, the larger Superman (Man of Steel) and Wonder Woman relaunches post-Crisis were followed by a number of smaller and sometimes subversive relaunches, including Grant Morrison's Animal Man and Time Masters. The writers can't help but nod to times past, as when former "Forgotten Heroes" Rip and Animal Man encounter one another in this book and Rip is sure they must have met before. At the same time, Rip meets here for the first time former Time Masters Bonnie and Corky Baxter, teaming with fourth Time Master Jeff Smith. As Wayne and Shiner re-introduce the four established characters, they inject some unexpected reality too the mix. Shiner notes in his afterword how the makeup of the original Time Masters followed the pattern set by the Fantastic Four and others -- a team made up of two men, a woman, and a child. In the new Time Masters, however, there's no platonic friendship between the adults; Rip and Jeff both vie for Bonnie's affections -- ardently and incongruously, since both only met her days previous. Bonnie herself spends much of the book flitting from man to man -- kissing Rip but sleeping with Jeff, and before them having a scandalous relationship with her professor, Cave Carson. Young Corky is hardly the group's mascot; he can't time travel at all due to an early accident, so he mainly makes bitter comments in the background up to the point where, in the end, he hangs himself. To be clear, picture this in Fantastic Four terms -- Time Masters is essentially a story where Mr. Fantastic and the Thing fight for eight issues over the love of Sue Storm, and then Sue picks the Thing; meanwhile, the Human Torch bides his time awhile before committing suicide. Even the threat that the Time Masters face, in its own way, deconstructs the Time Masters concept. When a rogue employee blows up Rip Hunter's lab, Rip follows incidental clues to reveal the presence of the Illuminati, a secret organization lead by Vandal Savage that Rip believes, among other things, murdered George Washington and replaced him with their own double. Rip's clues are so vague, however, and the Illuminati's supposed crimes so conspiratorial, that a number of characters suggest over the course of the series that Rip might just be making the whole thing up. This is the edge of time travel, something that might have been interesting to see explored in the Booster Gold series, where the fact that secret events took place in the past or the future make it hard to prove that they ever happened at all. Further, at the end of Time Masters, Bonnie finds the Illuminati working for good in the future, such that she convinces Rip to cease trying to stop them in the past. Rip's efforts against the Illuminati come to naught, with the strong suggestion that the past can't be changed anyway; as a "first look" at time travel in the post-Crisis DC Universe, the book makes time travel seem near impossible, if not useless, a wonderfully challenging idea at the time even if nowadays DC characters travel through time like walking to the restroom. Considered in this way, Time Masters is a dark book; fighting for a cause is a thankless prospect, and time travel seems an overly desperate prospect. Rip appears to understand in the end that people can't change time, just themselves -- illustrated in the two bachelors Cave Carson and Jeff Smith adjusting to life alone, Bonnie finally defining herself in the future away from the men, the character Tony giving up her life on the street, and Rip letting go of his obsession with the Illuminati when he's stranded in the past. None of the characters achieve what they tried to through time travel; instead, they all learn to accept what they have. Shiner suggests in his afterword that an intended sequel never manifested, which might, I'm guessing, have at least resurrected Corky, if not shed a more positive light on time travel in the DC Universe. Fans of the current incarnation of Rip Hunter won't find Time Masters essential reading. At the same time, I found fascinating how this book attempts to put to lie any of a number of comic book conceits, not in the least how blithely characters like Booster Gold travel between eras (and that these Time Masters barely get along with one another, if at all). 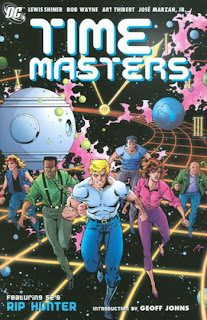 Time Masters is a decidedly different take on time travel in the DC Universe -- probably best that it wasn't a lasting take -- and an interesting slice of post-Crisis on Infinite Earths DC Comics history, if not a terribly flattering one. More time travel action coming up, when Flashpoint and The Return of Bruce Wayne collide in our review of Time Masters: Vanishing Point, coming up next. I recently picked up Time Masters: Vanishing Point and had no idea that there was a previous Time Masters series. I'm on the fence right now, can't decide if I should add this to my list. Anyone care to nudge me in either direction? It is an interesting send-up of Fantastic Four and other like concepts, and there's a very minor tie to Grant Morrison's Animal Man series, but in essence this story is completely out of continuity at this point, and neither related to Time Masters: Vanishing Point nor to Rip Hunter in the Booster Gold series. If your buying choice is between this and something that would enrich your enjoyment of the current DC Universe, I'd choose the latter. I do tend to lean toward series that are more closely tied to the current DCU, but not exclusively. Right now I'm looking at picking up the late 80s/early 90s Question series that doesn't look to have much connection to the rest of the DCU, but I enjoy the character and figure I'll enjoy the series. I bought all of The Question TPB's (haven't read the last one yet) and it definitely does not tie in with the DCU much; If I remember correctly, Batman and maybe Green Arrow show up, but in an independent non-crossover way. There are overall story arcs, but most issues also stand on their own. If you already like the character, then I would pick up the books before they go out of print. It's unlikely that that'll get printed again. See, Mark, it's talk like that that will cause me to binge and buy all those Question trades immediately. Thanks for the nudge. Well, as someone who had a hard time (and had to pay a premium) to track down all of the out-of-print Geoff Johns Flash TPB's (before they announced those Omnibus editions), it's something that I always keep in mind now when deciding which trades to buy. I ran into that exact same issue when picking up the Geoff Johns Flash series, so I know exactly what you mean. Is there a good way to keep track of what books are going out of print? That would certainly help me avoid paying ridiculous prices for trades down the road. *This* is why I would advocate, cost aside, that DC publish more omnibus hardcovers. I'd love to read that Question series, but tracking down and buying six trade paperbacks? It's just too much. Stick 'em in two or three hardcovers, I'm more likely to be there. If you're worried about being able to find them, 2 through 6 are all available at In Stock Trades. Loved this mini! It came out at the time I was most heavily collecting comics as as a kid. I loved the brief connection to Animal Man with Buddy's lying explanation for the time-pack adding an extra dimension to Morrison's story. What a great story -- thanks for sharing! I would even venture I liked this more than Time Masters: Vanishing Point; I don't see the original Time Masters book as a story so much as an experiment-in-prose (kind of like the original Authority stories), but what a trippy experiment it is! Worth checking out as a slice of an era. Dijonase -- Ah, but there's the rub, right? Only vols. 2-6. If there was a hardcover, maybe they'd be easier to find. Here's hoping. You can still find vol 1 on amazon.co.uk. Sad thing is, that there should be more than this, as there were annuals, sometimes where the story ran over into Batman or Green Arrow Annuals (still by O'Neil though)and also a few issues of THE QUESTION QUARTERLY.